Six stories above 16th and race, an elevator opens to a secluded street complete with a parked car, cobblestone sidewalks, a telephone booth, raised garden beds and potted peppers, tomatoes and pumpkins. At its peak, the rooftop is blooming with life, far from the echoes of car horns and SEPTA bus screeches below. A nurse rolls a patient garden-side and they examine the fruits of this season’s harvest, picking a sample of thyme to smell before heading indoors. Tucked away in the rooftop’s corner, a lush greenhouse stands full of current and future patient projects—tables of budding herbs, orchids and succulents. This is the Horticultural Therapy Center at the Magee Rehabilitation Hospital. In the mid-’70s, the program was initiated by Linda Ciccantelli, Magee’s first director of horticulture therapy, as a small project in the hospital basement. The plants were first contained in a single light cart—a tall plant stand with shelving units and fluorescent bulbs for growth. 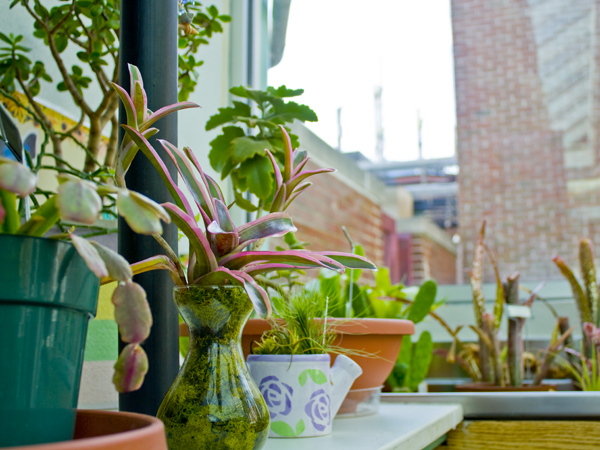 Today the program has blossomed into the only horticultural therapy program in Center City with a rooftop greenhouse. Magee treats patients with a variety of severe conditions—spinal cord injuries, brain injuries, strokes. Many people are bedridden and paralyzed. And it’s the job of the hospital’s horticultural therapist, Jeannette Glennon-Morrissey, to determine which gardening activities and nature crafts are suitable for each patient based on therapeutic and rehabilitative goals. Without a doubt, there’s an activity for everyone. “I’ve done everything from flower arranging [and] plant propagation to making garden stones,” she adds. But the list continues. Up in the sixth floor greenhouse, bottles of herbal vinegar line the table. Under a light tray, individual containers of herbal seedlings begin to sprout. Along the side, Glennon-Morrissey reveals her bin for worm composting and a net for soon-to-arrive monarch caterpillars. Today’s activity is plant propagation. Glennon-Morrissey takes out all the usual supplies for gardening—trowels, pruners, a cart of potting soil and pots of mint creeper, coleus and citronella—with one unusual addition. A tray of handcuffs is placed in the mix, used to support patients as they hold pruners and shovels to build back their upper arm strength. A group of wheelchair-bound patients gather around cloth-covered tables in the hospital’s gymnasium. “A lot of times when people are busy doing gardening, they forget all about the pain,” one nurse says to an older woman, who just barely opens her eyes in response. And yet, an hour later, dirt covers the cloth liners, patients are busy planting their second or third plant, and the same woman can’t decide between the green or blue stones to use to embellish her mint creeper.